Delirium is a disturbance of consciousness, cognition and perception that occurs frequently in medically ill patients. Although it is associated with increased morbidity and mortality, it is often not recognized and treated by physicians. Literature searches were conducted using MEDLINE with the following keywords/ phrases: delirium, acute confusion and management. Additional articles identified by hand-searching in major journals of medicine and psychiatry, and a review of references cited within these sources supplemented the search. In this article, the available published literature regarding the diagnosis, prevention and treatment of delirium is systematically reviewed. Prevention and treatment strategies do not need to be complex or expensive but require well-coordinated interventions from multiple disciplines, including nursing, psychiatry, neurology and primary care, as well as the cooperation and significant effort of family and friends. Atypical antipsychotic agents offer some advantages over haloperidol and in a limited number of studies appear safe and effective for delirium. Background : Tuberculosis (TB) is an important cause of mortality and morbidity in human immunodeficiency virus (HIV) infection in Africa. The interaction between TB and HIV infections is reviewed. 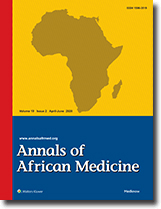 Methods : Literature on TB, HIV and their co-infection, especially in sub-Saharan Africa, including Nigeria, is reviewed. Results : Burden of TB is fueled by the HIV epidemic, and clinical presentation of TB may be atypical with co-infection. Recommendations on drugs and timing of antiretroviral therapy (ART) initiation are discussed. Use of cotrimoxazole prophylaxis (CPT) in co-infected patients reduces morbidity and mortality, while the principles of TB prevention in HIV infection can be summarized with the three I's: intensive TB case finding and surveillance, isoniazid preventive therapy (IPT) and infection-control measures; to these can be added a fourth 'I,' viz., instituting ART. Clinical complications like drug resistance, toxicity and drug interactions; and immune reconstitution inflammatory syndrome (IRIS) with CPT, IPT and ART are highlighted. Emergence of drug-resistant- and nosocomial- TB in HIV infection poses serious challenges and potential consequences in Africa, and appropriate measures are recommended. Conclusions : Many barriers exist for optimizing the care of the two diseases, but the aim should be strengthening capacities, collaborations, linkages and eventually integrating the services. Interventions for TB prevention in HIV infection should be widely implemented. Background : Hypertension is a disease characterized by end-organ complications, leading to high morbidity and mortality in many cases. People with untreated or uncontrolled hypertension often run the risk of developing complications directly associated with the disease. Left ventricular hypertrophy (LVH) has been shown to be a significant risk factor for adverse outcomes both in patients with hypertension and in the general population. We investigated the prevalence and pattern of LVH in a treated hypertensive population at the University College Hospital, Ibadan, Nigeria, using non-hypertensive subjects as control. Design and Setting : A prospective observational study performed at the University College Hospital, Ibadan, Nigeria. Methods : Patients had 6 visits, when at least one blood pressure measurement was recorded for each hypertensive subject and average calculated for systolic blood pressure (SBP) and diastolic blood pressure (DBP) separately. The values obtained were used for stratification of the subjects into controlled and uncontrolled hypertension. Subjects also had echocardiograms to determine their left ventricular mass. Results : LVH was found in 14 (18.2%) of the normotensive group, 40 (20.8%) of the uncontrolled hypertensive group and 14 (24.1%) of the controlled hypertensive group when left ventricular mass (LVM) was indexed to body surface area (BSA). When LVM was indexed to height, left ventricular hypertrophy was found in none of the subjects of the normotensive group, while it was found present in 43 (22.4%) and 14 (24.1%) subjects of the uncontrolled and controlled hypertensive groups, respectively. Significant difference in the prevalence of LVH was detected only when LVM was indexed to height alone. Conclusion : Clinic blood pressure is an ineffective way of assessing BP control. Thus in apparently controlled hypertensive subjects, based on office blood pressure, cardiac structural changes do remain despite antihypertensive therapy. This population is still at risk of cardiovascular events. Background : The general observation that children achieve better convalescence in the home environment supports the need for adoption of day case surgery, which is gaining considerable acceptance in developing countries. Pediatric surgical service is in great demand in developing countries, and in-patient beds and surgical supplies are insufficient. Method : A prospective collection of data on all pediatric day surgeries (PDSs) by the pediatric surgical unit University of Ilorin Teaching Hospital (UITH, Ilorin, was done. Parents had pre-operative outpatient briefing and postoperative interviews on the second and ninth days for consultation regarding post-operative complications and events at home. Study period was between April 2005 and September 2007 (2½ years). Results : Of the 660 elective cases, 449 (68.02%) children were recruited as day cases. The male-to-female ratio was 14.3:1. Age ranged between 20 days and 15 years with a mean of 37.6 months and standard deviation (SD) of 34.4 months. Congenital hernias/ hydroceles were the highest indications (71.2%), followed by lump/ masses (12.9%), undescended testes (8.7%), umbilical hernias (4.8%) and thyroglossal duct cyst (2.5%). In 98.9% of cases, the parents resided within 20 km radius of the hospital, and 91.5% of them could reach the hospital within 1 hour. 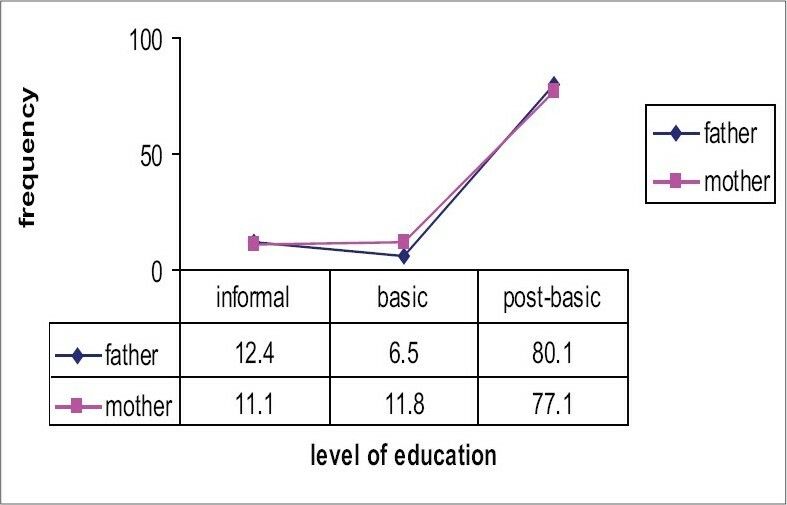 Fathers and mothers of 80.1% and 77.1% of children, respectively, had above-primary education. More than half of the fathers (55%) were civil servants, while 30% were self-employed. The mothers were civil servants in 37.3% of cases, and 34% were self-employed. The average number of outpatient clinic visits before surgery was 2-3 visits (41.2%) with mean interval to surgery of 4-5 weeks (60.3%). Logistics (investigations and availability of operation list) and patient's fitness for surgery were statistically significant delay factors (P= 0.001). Conclusion : Parents reported 14 children to be irritable at home due to pain, while the others reported satisfactory day case experience. No unplanned admission or mortality was recorded, and only 3 (0.8%) parents would not recommend day case surgery to other people. Conclusion: Pediatric day case surgery is feasible for well-selected and monitored cases in our environment. Term neonates with informed parents are suitable for pediatric day case surgery. There is a need for a day case center to reduce waiting list at UITH. Background : Tetanus remains one of the major public health hazards of the developing world. Previous studies in Nigeria indicate that mortality ranged from 26% to 60%. Mortality is much lower in the developed world because of the availability of facilities for intensive care of cases, unlike in most developing countries. Aim : To report our experience with the management of adult tetanus at the University of Port Harcourt Teaching Hospital over the past 10 years (1996-2005). Methods : Data of all patients aged 16 years and above managed for tetanus in the medical wards between January 1996 and December 2005 were retrieved from their case records and analyzed. 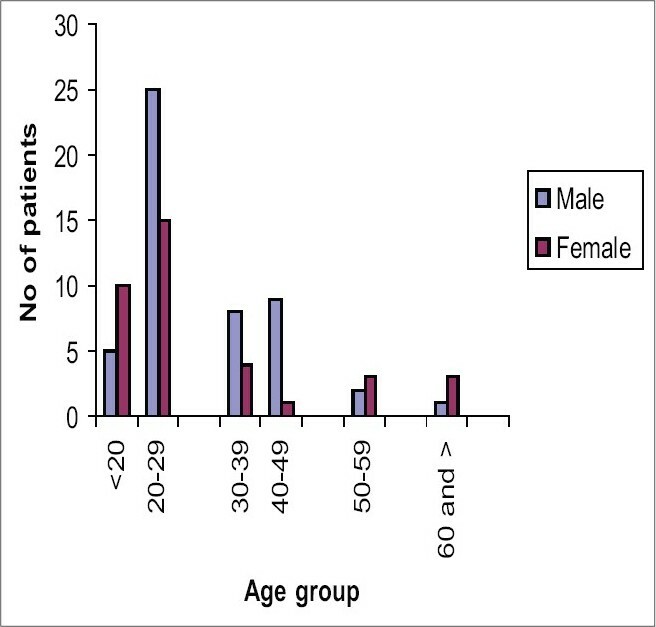 Results : Eighty-six patients were managed for tetanus (50 males and 36 females), constituting about 1% of all medical admissions over the 10-year period. Students, civil servants and commercial motorcyclists formed the major groups at risk. The commonest portal of entry was lower limb injuries (54%). Case fatality rate (CFR) was 42.9%, with a statistically significant higher CFR found among patients above 40 years of age (P= .000), patients with incubation period shorter than 7 days (P= .04), those with a shorter duration of hospitalization (P= .000) and those administered higher average daily diazepam doses (P= .044). Complications such as aspiration pneumonitis, laryngospasm and respiratory failure were major causes of mortality. Conclusion : Case fatality rate of tetanus has remained consistently high at our center. Factors that were significantly associated with high mortality included older age, age above 40 years , incubation period of less than 7 days and higher degree of sedation with diazepam. It is recommended that preventive immunization against tetanus be given to all Nigerians with secondary vaccination at adulthood. Background : Fever is a common reason for seeking medical attention, with febrile illnesses accounting for 10% to 20% of pediatric visits to emergency departments. A history of fever or presence of fever by palpation or measured temperature is required on the Integrated Management of Childhood Illnesses (IMCI) algorithms as a reason for the assessment of fever, which will lead to specific classifications that are linked to treatment protocols. Therefore, the WHO and its partners assume that mothers are able to assess their children for the presence of fever. Objectives : To evaluate the ability of mothers to determine the presence of fever in their children by tactile examination of their children. Methods : We prospectively studied 126 mother-child pairs attending the pediatric outpatient clinic of Ahmadu Bello University Teaching Hospital (ABUTH) . Mothers of children 2 months to 5 years of age who mentioned fever as part of the presenting complaints were studied using a structured questionnaire regarding their children's illness, temperature status and their educational level. Results : A total of 126 mother-child pairs were studied, of which 44 (34.9%) of the mothers had had their education extended to secondary school level and only 15 (11.9%) had their education extended to a tertiary level. Fever was present in 82 (65.1%) of the children when their temperatures were determined by thermometer. The mothers correctly identified 79 (sensitivity of 96.3%) of the children who were truly febrile and 19 (specificity of 43.2%) of those who were truly nonfebrile. 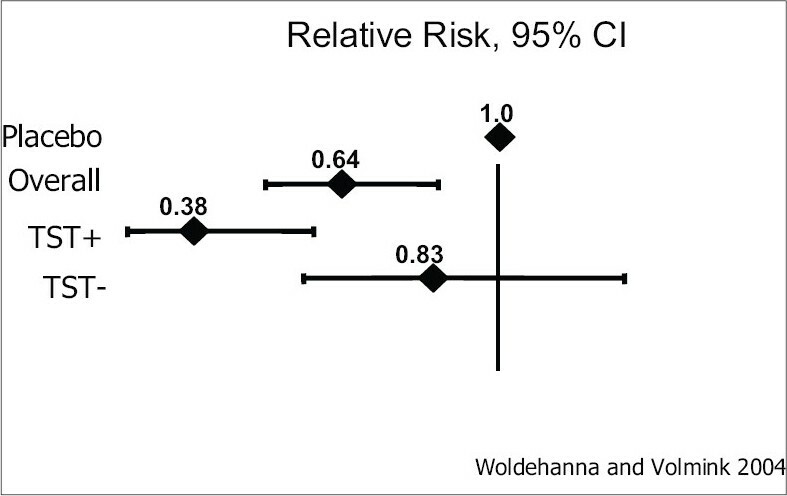 The predictive value of a positive test was 76.0%, and the predictive value of a negative test was 86.4%. Conclusion : The results showed that mothers in our environment, as has been observed in other parts of the world, are able to correctly assess the presence or absence of fever in their children. Background : Irritable bowel syndrome (IBS) has been reported to be common in the West. Community surveys are lacking in the African setting. We determined the prevalence of IBS in a rural community setting in Nigeria. Method : Questionnaires were administered to consenting individuals. Subjects satisfying the Rome II criteria for IBS were invited for physical examination at a health center to identify the presence of "alarm factors." Results : One hundred forty (31.6%) of the 443 evaluated individuals fulfilled the Rome II criteria for IBS, with a male-to-female ratio of 1.37:1 (P= .11). The prevalence of IBS was highest (39.3%) in the third decade, followed by 25% in the fourth decade (P= .009). Ninety-six (67%) IBS individuals had the alternating pattern of diarrhea and constipation, whereas 28 (20%) and 19 (13%) had constipation and diarrhea subtypes, respectively. Conclusion : IBS as diagnosed by the Rome II criteria has a high prevalence in the African rural population, as obtained elsewhere. Objective : To evaluate the pattern of cervical dilatation in live singleton pregnancies with spontaneous onset of labor and to compare any differences among nulliparas (P ara 0) and multiparas (Para ≥1). Material and Methods : Descriptive statistics are presented for 238 consecutive labor patients with spontaneous onset, ≥37 weeks gestation, live singleton pregnancy and who had spontaneous vertex delivery at the University of Ilorin Teaching Hospital, Nigeria, from May 2004 to June 2004. Pre-labor rupture of membrane and referred cases were excluded. Results : The mean cervical dilatation on presentation and duration of labor before presentation in labor ward among nulliparas were 5.40 cm and 6.66 hours; and among multiparas, 6.45 cm and 5.15 hours, respectively, the overall mean being 6.12 cm and 5.63 hours, respectively. The average time spent to achieve full cervical dilatation from time of arrival in labor ward was longer in nulliparas (4.80 hours) than in multiparas (3.60 hours) (t test not significant; P> 0.05). Overall mean total length of first stage of labor was 9.36 hours, while the total length of first stage of labor was 11.03 hours and 8.53 hours for nulliparas and multiparas, respectively (difference is significant; t test P< 0.05). 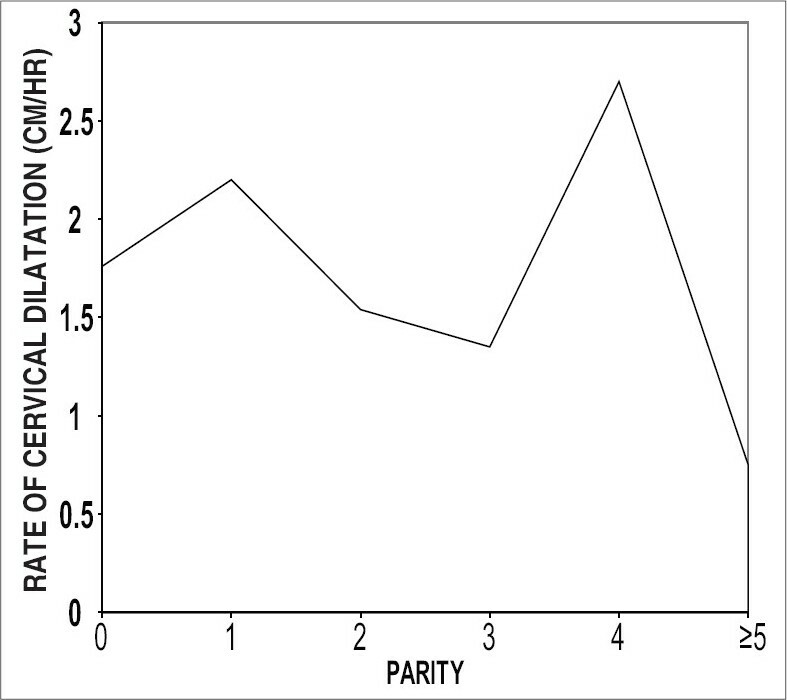 Significant negative correlation existed between parity and total length of first stage of labor. Mean cervical dilatation rate in labor ward (active phase) was higher in multiparas (1.83 cm/h) than in nulliparas (1.76 cm/h), but the difference was not significant (t test P> 0.05). No significant correlation existed between rate of cervical dilatation and maternal age, gestational age and fetal size. Conclusion : It is evident from this study that higher the parity the shorter the length of first stage of labor; however, significant difference existed only in the first half of first stage of labor between nulliparas and multiparas. Mean rate of cervical dilatation was greater than the WHO-specified and Philpott's lower limit of 1 cm/h in active phase of labor. Portal biliopathy (PB) is a term used to describe biliary ductal and gallbladder wall abnormalities seen in patients with portal hypertension. The pathogenesis of PB is not well known. It has been postulated that external pressure of portal cavernoma and/ or ischemia may play a role. 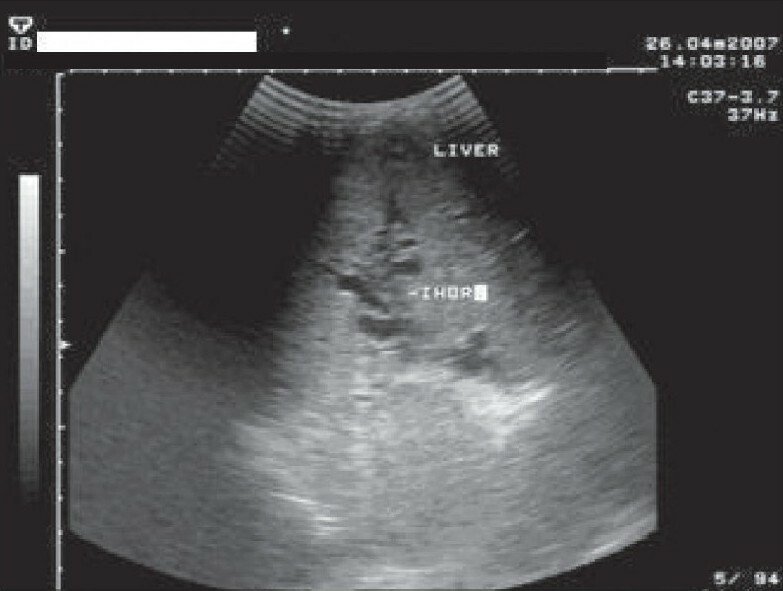 We report a case of a patient with PB presenting with obstructive jaundice that involved endoscopic sphincterotomy and stenting. Severe preeclampsia and eclampsia are major causes of maternal and perinatal morbidity and mortality in many parts of the world. One of the uncommon effects of severe preeclampsia on the eye is sudden loss of vision. This blindness can be due to involvement of the occipital cortex or the retina. Although very alarming, this type of blindness is usually reversible following appropriate management of such patients. Here we present the case of a woman in whom fulminating preeclampsia was complicated by blindness. 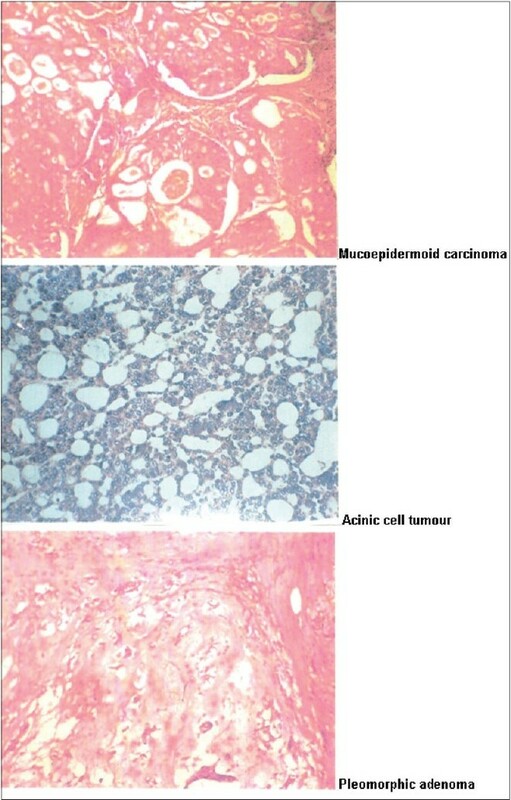 Fundoscopic findings were bilateral papillo edema and macular edema. She responded well to therapy, which included antihypertensives, seizure prophylaxis and operative delivery. Vision was restored by the third day. Syphilis and HIV infection are two STI diseases that have bidirectional influence on the clinical course of each other. There is a high risk of neurological extension if syphilis is not diagnosed early or if the patient has a co-infection with HIV. Both diseases have stigma associated with them and could affect the compliance to treatment, as was the case with this young employee of the medical department of a Nigerian tertiary hospital. He was diagnosed with HIV/ neurosyphilis co-infection and responded to penicillin therapy, but the fear of stigma at his workplace has made him to abandon hospital treatment for unorthodox therapy, which unfortunately cost him his life.